ResourceEditor tool is deprecated and no longer supported. We can't guarantee the stable work of the tool. AmbientMapper is used to generate ambient occlusion maps for low-poly meshes. It calculates self-shadowing from omni directional "sky light" as well as occlusion and attenuation of light by nearby geometry, and bakes it into the texture to adds realistic shading to the model. 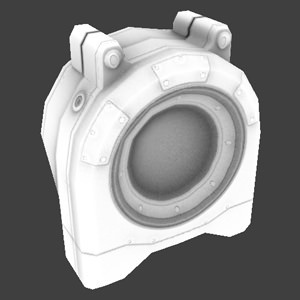 Load a low-poly mesh for which ambient occlusion will be calculated by clicking Load Low. Load a reference high-poly mesh by clicking Load High. This step is optional. 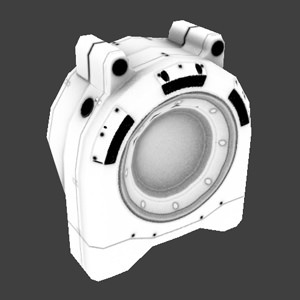 If a high-poly mesh is loaded, it will be used to calculate an ambient occlusion for the low-poly mesh. Switch to Ambient Map in one of the viewing panes. If necessary, load a cage mesh by clicking Load Cage. If necessary, load an environment mesh by clicking Load Env. 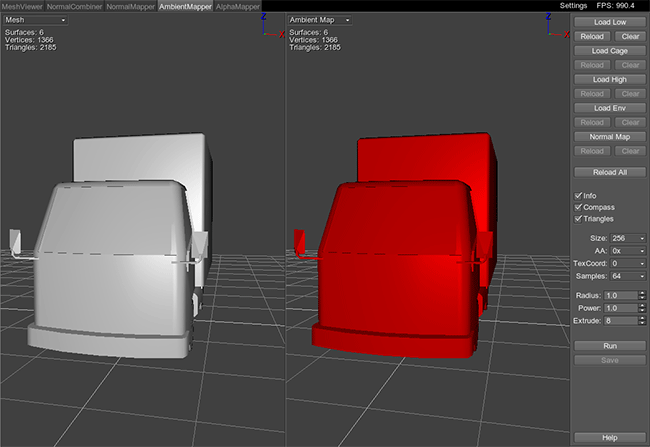 Set ambient occlusion options at the right side of the window. Click Run to start calculation. When ambient map calculation is completed, click Save. AmbientMapper is designed to work only within the first UV tile region (texture coordinates [0;1]). Multiple UV tiles are ignored. Mesh to display a low-poly mesh. 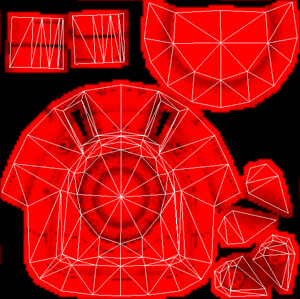 Normal Map to display the loaded normal map applied to the low-poly mesh. If there are no normal maps loaded, an empty one-channel (red) map will be displayed by default. Ambient Map to display the generated ambient occlusion map applied to the to the low-poly mesh. TexCoord 0 to display an ambient map generated basing on the first UV set. TexCoord 1 to display an ambient map generated basing on the second UV set. Cage Mesh to display a cage mesh. High Mesh to display a high-poly mesh. 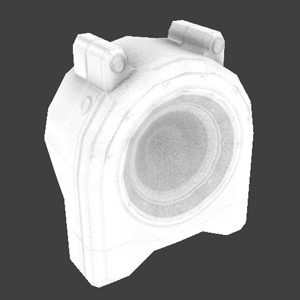 Load a low-poly mesh for which an ambient occlusion map will be created. You can also load a low-poly mesh by pressing Ctrl+O. 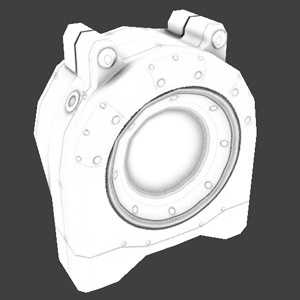 Load a high-poly mesh basing on which an ambient occlusion map will be baked. 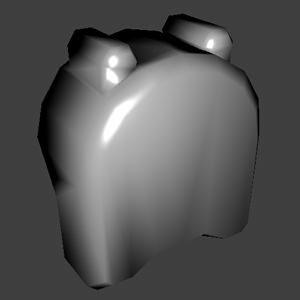 You can also load a high-poly mesh by pressing Ctrl+H. Load a cage mesh. 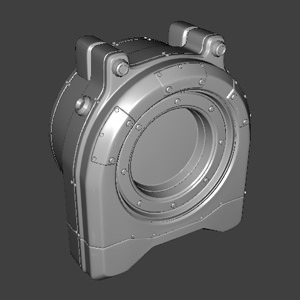 This mesh allows cleaner baking of the ambient occlusion map. Without a cage, the rays are cast from the low-poly mesh to the high-poly one (in both directions along the normals of a low-poly). It is done to determine what point of a high-poly mesh (full geometry of which allows to calculate proper ambient occlusion) corresponds to a low-poly mesh point. Whatever point is intersected first, it gets to be baked into the map. However, if there are complex geometry details in the high-poly model or overlapping surfaces, the first met point may not be a proper one! 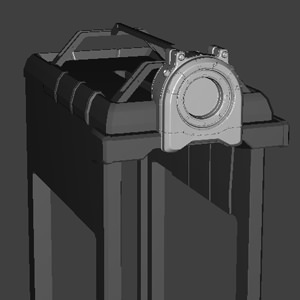 Instead of baking an outer surface, an underneath one that is closest to the low-poly mesh will be baked into a map. A cage allows to avoid such situations. When loaded, the rays are traced from it rather then from a low-poly. 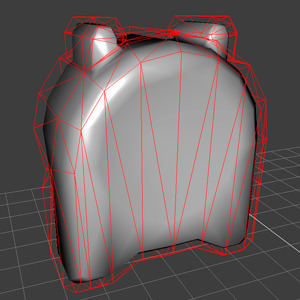 A cage mesh is usually a low-poly mesh slightly bloated to be bigger in size and cover both a high-poly and a low-poly meshes (see the illustration below). Though even a simple box would do for a cage. 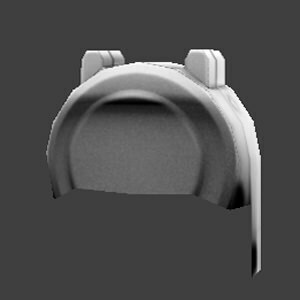 It should not necessarily cover all volume of the meshes. The cage can be partial - only above such surfaces where complex geometry details are found. 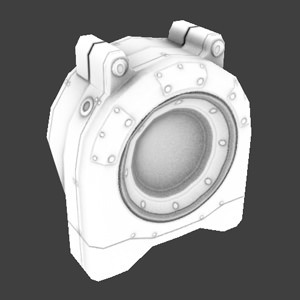 For example, if we set a cage above a surface with rivets, we will get correct ambient occlusion of all details. Without a cage, there can appear visual artifacts. AO without the Cage mesh. Details were not baked correctly. AO with the Cage mesh. All rivets are properly occluded. You can also load the cage mesh by pressing Ctrl+C. Load an environment mesh. This option allows you to load additional geometry that will occlude light for the source mesh and shadow it. For environment mesh itself ambient occlusion is not calculated. For example, if an occluded mesh is a part of some construction, the latter can be is loaded as an environment mesh. Here you can see that the mesh is adjacent to a bigger framework. With this option, the mesh backside will be shadowed. You can also load the environment mesh by pressing Ctrl+E. 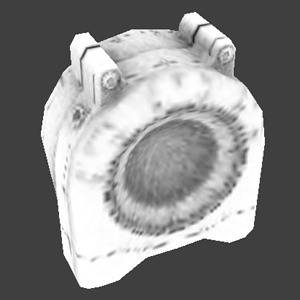 Normal map allows to calculate ambient occlusion without a high-poly mesh. It uses normals from the map to calculate how the light would fall onto the mesh. If both high-poly and a normal mesh are present, it creates a more correct ambient occlusion map with softer edges. You can also load the environment mesh by pressing Ctrl+N. You can also reload resources by pressing Ctrl+R. 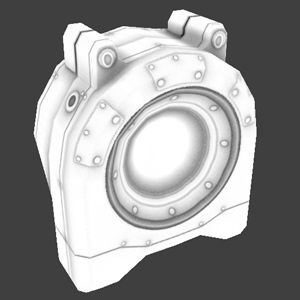 Perform the ambient occlusion calculations. The result applied to the model can be seen in the Ambient Map mode. 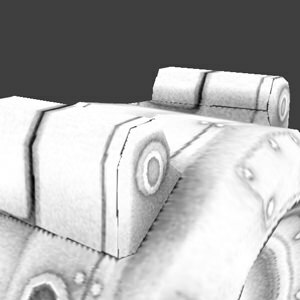 Save the calculated ambient occlusion map into the texture. See supported formats into which the texture can be saved. DXT1 compression - if a texture is saved into .dds format, it can be automatically compressed using this option. If another format is specified, the option will be ignored. You can also save the mesh by pressing Ctrl+S. Display information about the mesh that is currently in the viewport. Such data is shown as number of surfaces, vertices and triangles. You can also enable the option by pressing I.
Toggle an XYZ compass in the upper right corner of the viewport. You can also enable the option by pressing C.
Toggles showing a base grid plane. You can also enable the option by pressing T.
Size of the output ambient map. Anti-aliasing mode for the output ambient map. If used, it consumes additional memory. The higher the value, the softer and more blurred the ambient map will be. 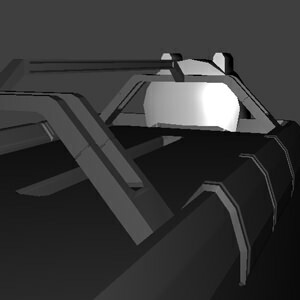 UV channel to store the ambient map in. To store the map in the second UV channel, the model should have been exported accordingly. The number of sampling light rays traced from each point of the mesh to calculate ambient occlusion. If a ray hits some geometry, it meas that the light is occluded and therefore the tested point should be shadowed. The more rays return occluded, the darker the resulting shadowing will be. The higher the value, the less grainy the ambient map will be and the longer time calculating it would take. Distance to trace the light rays to. To be exact, this is a radius for the hemisphere, within which the number of sampling light rays are traced in random directions. 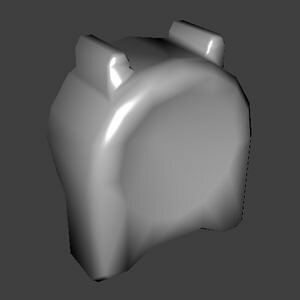 Small radius may be used to achieve sharp and dark occlusion of details. Big radius may be used to get the overall occlusion of the mesh. There will be no distinct details. The process of calculating AO will also take longer time. The power of ambient occlusion term. 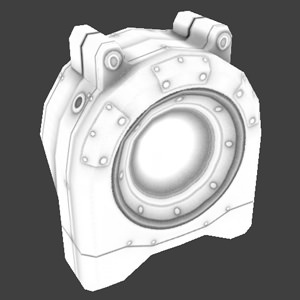 The higher the value, the brighter the resulting ambient occlusion will be. Extrusion in pixels. This option adds colored pixels around the contour of each UV shell. The color value is simply copied from the nearby pixel. It allows to get rid of possible darkening where seams meet. The lower the size of the ambient map, the more visible darkening along the seams is. Increasing Extrusion parameter may help in this case. Ctrl+O — load a low-poly mesh. Ctrl+H — load a high-poly mesh. Ctrl+C — load a cage mesh. Ctrl+E — load an environment mesh. Ctrl+N — load a normal map. Ctrl+R — reload all resources. Ctrl+S — save the ambient map. I — toggle mesh info. C — toggle a XYZ compass. T — toggle base grid. G — reset pivot from the mesh to the camera.